Comp Cards is rated 4.5 out of 5 by 2. Craft your comp cards in your own style with our custom sizes, paper types, and finishes. Rated 5 out of 5 by Di73 from Comp Cards I bought this for my daughter's potential modeling career and it looked great. It had a quality feel and look to it. Rated 4 out of 5 by Boymom3 from Printed a bit dark I was really excited to find a place to make the comp cards myself. We paid for great photos to be taken and I was just wanting to showcase them. I thought they looked good, but an agent commented that they were printed too dark. I paid for the cards to arrive quickly, and they didn't arrive on the date they were suppose to. 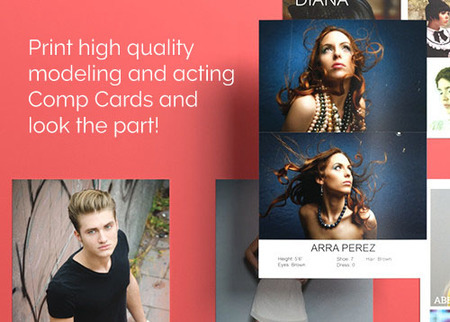 Put yourself into a position for that big modeling or acting break with professionally printed comp cards (also known as zed cards) from PrintPlace. We can help you put your best face forward (literally). High-quality comp cards will showcase your image at its best. After all, when you put your comp card on top of other actor or model comp cards, yours need to stand out. We combine the best paper, ink, and coating to make that happen. In a rush? PrintPlace.com comp card printing is available for same day turnaround service. For custom options, submit our custom order form or give us a call. Need layout help? Choose one of the layout templates below. Even if you're a pro at graphic design, it's a good idea to use these layout templates to check your dimensions and ensure your comp cards print correctly on our presses. Simply download the appropriate file from the list below. Comp cards are most often used as handouts, but you can turn yours into a postcard by selecting “Direct Mail Services” at checkout. Upload your mailing list and we will address and send your printed comp cards for you. If you do use PrintPlace.com direct mail services, it is important to note that UV coating cannot be added to side 2, as we are unable to inkjet addresses on that side of the cards. Mailing services includes addressing your list and presorting for postal discounts, as well as removing duplicate addresses if requested. With so much competition in the modeling industry, you have to do whatever it takes to stand out. We don’t need to tell you that though. What we should tell you is how to make sure your comp card printing stands above the rest. A typical comp card includes your name and headshot on the front of a glossy cover stock, with the back of the card left blank, or listing your stats and contact information. There are a few who add the name of the model agency they represent. Before sending your artwork for printing, do some minor touch-ups or airbrushing if you prefer. For creative professionals who are using comp cards to promote their work, make sure you use your best samples. Depending on the look you are going for, a high gloss or uncoated finish will make your comp card stand out. Our high-gloss UV coating will give your photo a high shine for a rich appearance. Our uncoated paper stock will give your cards a matte finish. Full color and full bleed are standard printing options here at PrintPlace. So your comp cards will impress any agent or casting manager. Comp cards can be used for fashion, entertainment, or any acting or modeling gig you’d like to audition for.